“A modern Italian place to meet” is Posto‘s motto, and indeed its Logan Circle neighborhood has been eagerly waiting to meet it. The newest venture from executive chef Massimo Fabbri, of downtown’s lauded Tosca, it replaces Viridian next to Studio Theatre and has already escalated in popularity, evident by the full dining room on a freezing Monday night. It’s a relief to find that Posto has warmed-up the walls of a previously minimal and rather chilly atmosphere from Viridian’s days. 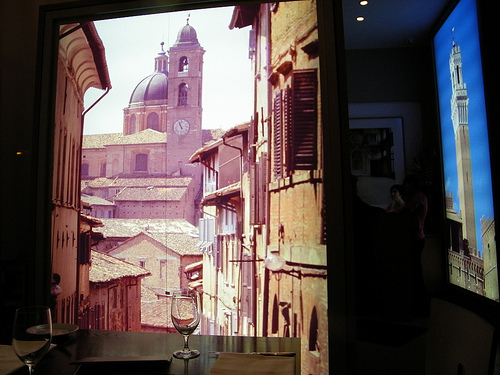 The decor might strike some as more Napa than Roma, with columns wrapped in glowing natural wood, but the large light installation murals of grapevines and various Italian scenes like Venice’s Campanile set the scene. Somehow these oversized murals, dancing the line between ironic and tacky, end up being rather joyous. And though many have commented on the decibel level, I found that though it was packed, our table of four could still carry on bantering without much problem. For my first course I tried the Pesce Spada - swordfish carpaccio with tomatoes, capers and olives. I was surprised to have it come out with a heap of frisee on top (not so much a fan of twiggyness in food), but it matched well with the fish, which was delicate and flavorful. A friend pronounced the Granchio – lump crabmeat with peppers – “very yummy” – but another’s Insalata del Posto - arugula salad with fennel – was deemed “overdressed” (then again, he is a very picky German). I’d heard pasta was the standout here, made in house by chef de cuisine Matteo Venini, and I was not disappointed. My Tagliatelle with Pheasant Ragout and Cardoons was absolutely perfect, toothsome pasta with a rich sauce that didn’t overwhelm. I was actually a bit jealous of my friend’s Romani order. This is what comfort food is all about, homely little medallions of baked semolina set off by spicy amatriciana sauce, served in a cast iron skillet. Totally what Nonna would make when you were feeling a bit blue. I ‘ve noticed the pizza has been pretty much damned by most informal and formal critics in the first few weeks of Posto’s opening. Our table had two pizzas that were deemed good, just not exciting. I think it may come down to expectations about the crust. If you like your pizza dough soft, you’ll be pleased. If you like it crisp giving way to chewiness, you won’t. Dessert was a tangy berry cobbler, that was really rather like cranberry soup with gelato, delicious regardless. As far as service, we had an extremely lovely waiter, a true Italian professional having just the mix of attentiveness and knowing when to leave us alone. I think it’s easy to go overboard here and rack up a large bill, but if you restrain yourself wine-wise and don’t go all out three courses as we did (well, it was for a birthday, after all) you could have a relatively inexpensive meal. It appears the pasta prices are at least half of what they are at Tosca, so they are making an attempt to feel our current economic pain. What I was unable to sample and definitely will return for is the polenta with braised sausage. Must compare to 1905′s polenta with merguez… solely in the interests of culinary science, of course! Posto is located at 1515 14th St. NW. For more information, (202) 332-8613. Please note Posto does not take reservations. I’ve eaten there once now (drank wine on multiple occasions) and had their steak (Monzo?) and a side of brussel sprouts and it was delish. It’s not my favorite restaurant in the city by any means, but it’s a good place to hit up after the gallery openings in the neighborhood. I have to say though, that my friends eat there a lot and have told me that their service is generally below par (which is actually par for DC restaurants). The wine menu is good, and the menu is exciting, but, at least the night I dined there, the overall experience was disappointing. The onion soup was thick and cold, and kind of gross. The pizza was alright, but the red pepper flakes that I’d asked for to spice up the pizza were only finally delivered when I was down to my last 2 slices. Finally, the panna cotta for dessert was hard and gummy, and inedible.